The Mulix (マリックス) is a Japanese 6×6 folding camera, made by Tanaka and distributed by Kuwata Shōkai from 1940 to 1943. The Mulix is an ordinary copy of the Ikonta 6×6, with a folding finder, a key at the top left to advance the film, strap lugs and a body release. The back is hinged to the right and has a single red window in the middle. The back leather is embossed MULIX vertically on the left and the case is also embossed MULIX. The body is extremely similar to the Lyra Six III and Lyra Six F made by Fuji Kōgaku, which was perhaps a subcontractor. The folding struts and the red window cover are engraved KKS, initials found on other Kuwata products. All the models are fitted with a front-cell focusing four-element Mulixar lens, made by Tanaka itself. Mulixar f/3.5 lens, B, 1–500 speeds. In the advertising picture, the finder's front part is black and the shutter plate has a K.S. (or maybe K.K.S.) marking at the top. The list of set prices compiled in October 1940 and published in January 1941, has a "Mulix I" for ¥79 and a "Mulix II" for ¥110, with no further detail. Mulix I: f/4.5 lens, slow speeds to 1/5s (¥79 in 1941, ¥93 in 1942). Various Mulix filters were offered to go with the camera, each at ¥5.80. Oddly, the model numbers don't follow a logical progression and the documents do not mention top speeds. 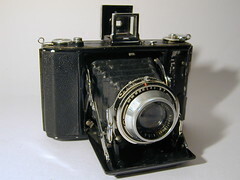 It seems that the camera listed as a "Mulix II" in the January 1941 price list now appears as the Mulix III. The April 1943 government inquiry on Japanese camera production mentions two versions of the Mulix, one with a Mulixar 75/4.5 lens and a KP III shutter (T, B, 1–200) made by Kinshō, and another with a Mulixar 75/3.5 lens and a Hydromatic Super (ハイヅロマチックスーパー) shutter (B, 1–500). 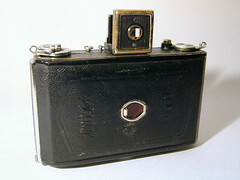 It is not known how many copies of the Mulix were made: the camera pictured in this page is one of only two examples observed so far. It has a Mulixar 75mm f/3.5 lens, and 200–1, B, T speed settings engraved on the shutter plate in that order. The bottom of the shutter plate is curiously marked K.PRONTOR.3, and there are also a circled 'K' on the right (camera's right: the 9 o'clock position as seen from the front) and a circled 'S' on the left of the shutter plate. The "K.S." initials probably correspond to Kinshō, and this shutter is probably the KP III (perhaps for Kinshō Prontor III). The other example (owned by Camera-wiki.org editor User:Eastwestphoto) has the same lens, serial no. 2750. Mulix II, Mulixar Anastigmat 75mm f/3.5 lens, speeds from 1s to 1/200. ↑ The Japanese pronunciation is closer to "Malix", and Kokusan kamera no rekishi, p.341, calls the camera "Malix" by mistake. ↑ "Kokusan shashinki no genjōchōsa" ("Inquiry into Japanese cameras"), item 90. ↑ Dates: advertisements mentioned in Kokusan kamera no rekishi, p.341. ↑ Four elements made by Tanaka: "Kokusan shashinki no genjōchōsa" ("Inquiry into Japanese cameras"), lens items Lb36 and Lc26. Advertisements dated January and July 1942 (reproduced in Kokusan kamera no rekishi, p.94, and formerly at Gochamaze (archived)) also mention four-element lenses. ↑ Advertisement in Asahi Camera October 1940, reproduced in Kokusan kamera no rekishi, p.95. ↑ "Kokusan shashinki no kōtei kakaku", type 4, sections 3 and 6A. ↑ Advertisement in Asahi Camera February 1941, reproduced in Kokusan kamera no rekishi, p.77; advertisement in Asahi Camera April 1941, p.512; advertisement in Hōdō Shashin January 1942, reproduced in Kokusan kamera no rekishi, p.94; advertisement in Asahi Graph 29 July 1942, formerly reproduced at Gochamaze (archived). ↑ Feature described in the advertisements dated January and July 1942. ↑ "Kokusan shashinki no genjōchōsa" ("Inquiry into Japanese cameras"), listing Japanese camera production as of April 1943, items 90 and 99, shutter items 18-P-9 and 18-Q-7. Asahi Camera. Advertisement by Kuwata Shōkai in April 1941, p.512. "Kokusan shashinki no genjōchōsa" (国産写真機ノ現状調査, Inquiry into Japanese cameras), listing Japanese camera production as of April 1943. Reproduced in Supuringu kamera de ikou: Zen 69 kishu no shōkai to tsukaikata (スプリングカメラでいこう: 全69機種の紹介と使い方, Let's try spring cameras: Presentation and use of 69 machines). Tokyo: Shashinkogyo Syuppan-sha, 2004. ISBN 4-87956-072-3. Pp.180–7. Items 90 and 99. "Kokusan shashinki no kōtei kakaku" (国産写真機の公定価格, Set prices of the Japanese cameras), listing Japanese camera production as of October 25, 1940 and setting the retail prices from December 10, 1940. Published in Asahi Camera January 1941 and reproduced in Shōwa 10—40nen kōkoku ni miru kokusan kamera no rekishi (昭和10〜40年広告にみる国産カメラの歴史, Japanese camera history as seen in advertisements, 1935—1965). Tokyo: Asahi Shinbunsha, 1994. ISBN 4-02-330312-7. Pp.108—9. Type 4, sections 3 and 6A. The Mulix is not listed in Sugiyama.